Div.1 Dingos v. Wildcats @Mohawk Park. 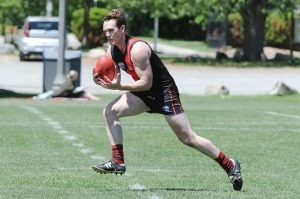 The Toronto Dingos notched up their seventh win for the season against the Hamilton Wildcats, with a comfortable 92-point win at Mohawk Park on Saturday. The Dingos matched the Wildcats and played 12 per side with 15-minute quarters, instead of the normal 20-minutes. With Tom “Thumper under the pumper” Humphries back from injury and Alex Aitken back in the mix, the Dingos started well in the middle and piled on five goals in the first term. Leading league goal kicker Wade “hand model from Budgee” Edwards kicked the first few to get the team up and running. Defender Mike “beast mode” Bocian played his best game for the season winning the contested ball around the ground and setting up numerous goals with handballs out of the pack to outside runners such as James “have-a-bounce” Duggan, Geoff “hound-dog” Hansen and Rob “Nod-by-Nod-West” McNaughton. The match was never in dispute and the Dingos were able to score just under five goals per quarter, a good hit-out after two weeks off. It was a real team effort with the Canadian core group hitting form at the right end of the season. The 7-3 Dingos now sit in third and will have to wait and see where they finish on the standings after the Guelph (next week) and High Park matches in the weeks to come. GOALS: Edwards (7), Duggan (4), Aitken (2), McNaughton (2), Hansen, Gaut, Humphries. DIV.2 Dingos v. Blues @ Humber South. The Div 2 Dingos continued their unbeaten run to the finals with another commanding 131-pt win over the Central Blues on Saturday at Humber South. The Dingos were relentless in their attack, syncing up a series of clever handballs and short kicks to weave through the Blues defense. Apart from a shakey 2nd quarter when the Blues kicked a goal after an uncharacteristic lapse in concentration, the Dingos easily dominated every patch of grass with a fine team performance. The goal count was spread nicely across the squad with Haycraft, Mulholland and McFarlane all kicking three goals a piece. Best on ground performances went to: Heath Neville, Canadian rookie Stephen Elliot and Irishman Kevin Mulholland. The Toronto Dingos play their final game against the High Park this Wednesday at Humber South, 6.30p.m. GOALS: Haycraft, Mcfarlane, Mullholland (3),Beasley, Elliot, Prior (2), Eckford, Mann, Neville, Tinkler, Jetson, Simmo (1).